Today , I thought I would show you guys what I have been loving for the month of March. Its hard to believe that March is almost over this year is literally flying by. In May I will be graduating college and it still seems so unreal. But anyways these are the products I been loving for the month of March. 1. Shea Moisture Fruit Fusion Coconut Water Shea Butter Lip Balm- I literally love this lip balm. I have braces so my lips stay constantly dry especially during the colder months. And this lip balm gives the perfect amount of shine and moisture. 2. Shea Moisture Low Porosity Protein Free Hair Line- My hair is natural curly and sometimes hard to manage but since I have been using this hair care product my hair has become easier to manage. I also love the smell of the product. Although it can be a little pricey in my opinion its worth it. I bought mines at Marshals for around five dollars. 3. Hot Cheetos are literally my weakness during the month of March. I cant even tell you how many bags I have been through. 4. I have also been obsessed with Chance the Rapper and his album. 5. My favorite TV show I been binge watching is Law & Order and Private Practice . I really love law shows and medical shows. 6. Max Factor Mascara- I have been using this nonstop anytime I head out. 7. I have also been more into you tube and creating videos and learning how to edit. Hope you enjoy what I have been loving for the month of March. 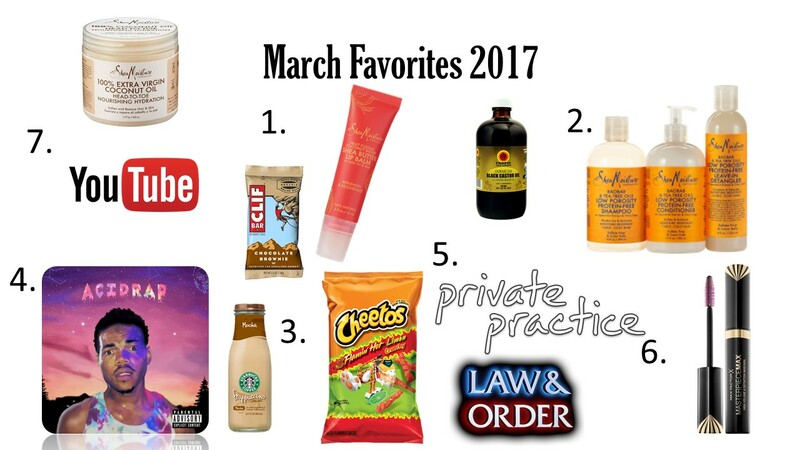 What were your go to essentials for the month of March ?